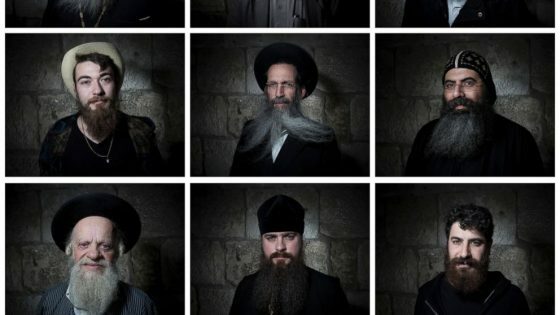 Facial hair is trendy worldwide these days, but in Jerusalem beards have never gone out of style, projecting religious mysticism, nationalism and ideals of masculinity. For men of all faiths in the holy city, a beard can be an important statement of religious devotion, connecting past generations to God through the tangled strands of history. Facial hair also reflects social mores in many communities. In some cases, it can even reflect one’s political views. Nowhere is this more visible than in Jerusalem’s Old City, where bearded ultra-Orthodox Jews, Christian clerics and devout Muslims all come into contact in a densely packed mix of some of the world’s most sensitive holy sites. For Eitan Press, 40, growing a beard is a spiritual journey that embodies ancient concepts of Jewish mysticism while challenging modern perceptions of masculinity. His beard balm company, “Aleph Male,” is more than a clever word play on the first letter of the Hebrew alphabet. He says it expresses Jewish values that stand in sharp contrast to the tough Alpha Male narrative often associated with facial hair. “Rather than being a man at the top of the pyramid, it’s the image of a man who is lifting his brothers up,” said Press, who has a majestic, full red beard. “When a man grows a beard, it is incumbent upon him to act with greater kindness, compassion and sensitivity toward the world because he is now wearing on his face a divine quality,” he said. At Jerusalem’s bustling Mahane Yehuda market, he demonstrated his unique blends on a recent day, “anointing” bearded shoppers with balms inspired by Jewish festivals and rites. One conjures up the citrus notes of Sukkot, the autumn festival that commemorates the desert wandering of the Jews during the Exodus. Items like myrtle branches and the etrog, a fruit resembling a lemon, are used in ceremonies. Another blend has aromas of clove and cinnamon, spices used in Havdalah, the ritual marking the end of the Sabbath and the beginning of the new week. The custom of religious Jews wearing beards is rooted in a passage in the Biblical book of Leviticus that forbids “destroying” beard edges and prohibits shaving with a blade. While Jewish law permits the use of electric razors or scissors to trim beards, some sects don’t shave at all. Michael Silber, a Hebrew University professor who has researched beards, said that some Orthodox Jewish communities, leaning on Jewish mystical texts, consider facial hair so holy that men refrain from even combing their beards, fearing they will pull hair out. Strands that fall out naturally are sometimes placed in prayer books for preservation, he said. For the pious that follow such teachings “beards are a channel of divinity” connecting them to God, he said. Zuheir Dubai, an Islamic scholar and imam in the West Bank city of Nablus, said that while Muslim men grow beards for religious reasons, moustaches are rooted in popular culture. Some grow moustaches to emulate powerful leaders, like Iraqi dictator Saddam Hussein, he said. Some autocratic governments in the Mideast were known to shave off a prisoner’s mustache as a form of humiliation, Dubai said. In Syria, Jordan and Lebanon, some men swear by their mustache, putting their hand on it to convince people to accept their word, Dubai said. Muslim beard traditions stem from the time of the Prophet Muhammad, who in the 7th century urged his followers to wear beards and “shorten the mustache as a sign of modesty.” They regained popularity in modern times with the rise of political Islam about three decades ago. Some Muslims tint their beards orange with henna, which may have been used by the prophet, Dubai said. Among Orthodox Christian priests, long bushy beards are as common a sight as their long, flowing robes on the narrow, winding cobblestone streets of Jerusalem’s ancient Old City. They see a beard as a sign of devotion to God and homage to Jesus — traditionally portrayed with a beard. In Jerusalem wearing a beard can also reflect political sentiments. “In the 1980s religion begins to be intertwined with political orientations and this is reflected with the rise of the beard among the more right-wing oriented and religiously oriented, both Jews and Muslims,” Silber said. Many bearded men, of course, often have simpler motives and just like the style. Tal Johnson, a barber in the Israeli city of Holon, said growing one is not as easy as it looks. “You can’t eat with it … there are lots of things that are terrible, like hummus … or fried egg that is runny, and you need to wash it afterward, all of this, it’s very complicated. Eating soup is awful,” he said. For Heath Loftis, an American visiting Jerusalem, it has a different meaning altogether.